Do not miss out this great chance to get up to 60% in the Clearance. Huge reductions in Technology, Baby & Nursery, Sports & Leisure, Clothing, Home & Garden and More! Where do I use my Argos voucher code? Find what you want to buy and add them to your basket. When you are ready to proceed click “Go to Trolley”. Choose whether you would like to reserve for in-store collection or choose to get your items delivered. When you choose home delivery, you’ll need to sign into your account. Enter your delivery/payment details and then enter your promo code into the box just the below payment details section. Your savings will be automatically applied to your order. "The dedicated Price Cuts page shows the great Argos offers available right now all in one place- so you can browse money saving multi-buys, high percentage discounts, special offers and sometimes Argos promo code giveaway offers too!" “Save on delivery charges by collecting from your nearest Argos store instead”. Argos stock a plethora of products in their online catalogue. Discover everything for your home and family in the impressive category lists featured on the Argos homepage. Browse through home and garden, technology, baby and nursery essentials and extras, toys, sports and leisure items, health and beauty necessities, clothing, jewellery, watches and gifts. Whether you’re after the latest high-tech gadget, Apple MacBook or 4K TV, you can find plenty of great prices on all the best technology at Argos. And that’s not all, Argos also offer a selection of furniture and accessories for your home and garden as well as handy baby items such as pushchairs, travel systems, baby bouncers, car seats and stair gates, all for incredibly low-cost prices too. If you’re shopping for your children, Argos is the ideal option, stocking all kinds of toys including action figures and playsets, LEGO and construction toys, dolls, outdoor toys and more, all from huge brands like Chad Valley, Disney, Little Tikes, Marvel and Playmobil. Throughout the year Argos add new categories to their homepage for a limited time only, like the ‘back to uni’ tab and the ‘Easter’ category, allowing you to find all the low-cost essentials you need for that time of year. And remember, if you’re shopping on a budget there’s always the clearance section too. Whether it’s savings on electronics and gadgets or deals on home essentials, shopping with Argos guarantees low-cost price tags and hundreds of great discount options. As well as our voucher codes and deals you can discover great ways to save in the clearance section located on the Argos homepage. Here you’ll find various slashed prices on technology, home and garden products, toys, health and beauty, clothing, jewellery and sports and leisure. And it’s not just the clearance section. Argos also feature many percentage discounts across selected lines on their homepage, as well as regular 3 for 2 options on a range of products on their online store. Argos have regular online sales throughout the year, offering a multitude of products at reduced prices. As well as these frequent sales Argos also advertise smaller, money saving opportunities on their homepage such as the baby event-where you’ll find various baby products with prices cut- percentage discounts when you spend a certain amount on selected lines and 25% off TU clothing. These are just three examples of the many sales at Argos, to keep up to date with all the latest sales and discounts sign up to the Argos newsletter for notification as soon as they commence and never miss out on a bargain again. When it comes to toys Argos is your number one stop for everything from board games and puzzles to electronic toys and gadgets! Find all the must-have, latest toys that your kids are dying for including bestsellers from Nerf, Playmobil, Little Tikes and Paw Patrol, all of which are low cost and accompanied by flexible delivery and collection options. 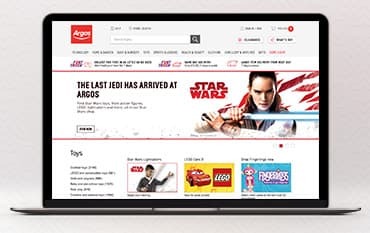 Argos include many exclusive lines from top branded toys in their online shop including collections from Hot Wheels, Fisher-Price, VTech, Barbie and LOL Surprise. When it comes to special occasions like Christmas Argos reduce prices on many popular indoor and outdoor toys for kids of all ages, as well as great stocking fillers and new in games and consoles. Standard delivery: £3.95. Order by 8pm for next day delivery Monday-Saturday via trusted couriers. Fast track same day delivery: £3.95. Order by 6pm and get it delivered by 10pm, 7 days a week. Royal Mail delivery: Free. Applies to specific products only, products delivered within 4 working days. If you want to save on delivery costs, order online and pick it up for free at your local store. Find the full delivery details here. Returns are quick and easy, and the majority of items available at Argos are sold with a 30-day money back guarantee. As long as the product has not been used, is in its original packaging and you have your receipt, Argos will refund you on your purchase. To find your nearest Argos and it’s opening hours, use the Store Locator. With over 33,000 products in its online catalogue, flexible click and collect options and plenty of deals and discounts, Argos is the ideal place to come for low cost, big branded homeware, electricals, clothing, jewellery and more. Use our Argos voucher codes to make great savings on your basket total. Argos have something for all the family, with products from top brands like Bose, Beats, Dyson, LEGO, Nespresso and Samsung, and exclusive lines like Chad Valley and Heart of House. You can also discover a selection of great 3 for 2 offers at Argos as well a handy clearance section. We are constantly on the hunt for first order Voucher Codes for Argos to help you with your money saving. Our experts check dozens of sites for secret codes including NHS discounts, student sites & social media channels saving you time & money!